A Prototype was already shown at an NFC Conference in London (03/2008) and WIMA (04/2008). There you could see the following/get the following information: A very nice thing about the Nokia 6212 is the design of the antenna, thus you do not need to touch the phone at a special point. Just bring the phone close to a smartposter/tag/other phone and you will see a reaction. There are some new features implemented like saving alarms on tags etc. One Issue is, that the display light needs to be on, order to have also the reader/write capabilities on as well. This is the way to safe battery. The device uses an intern secure element (as the Nokia 6131) and NOT (!) the UICC. Using the UICC is not a matter of firmware. In order to talk to the SIM (thru the NFC Chip!) it requires the NFC Chip to support HCI and SWP and at the moment the used chip for the of-the-shelf-phone does not support that. 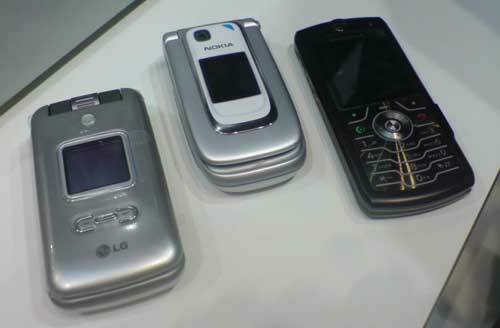 There are already several phones out in the market using the UICC as the secure element today (08/2008): The Sagem my700X, the LG L600V, the Nokia 6131 SWP and the Motorola SLVR L7. All devices are more or less concept devices and come with an Inside NFC Chip inside. The device have been shown already at Cartes 2007 and Mobile World Congress 2008. In order to develop applications with these devices an SDK (like the Gemalto Developer Suite) and a SWP UICC is required. All four devices are already capable of using SCWS. The Motorola, the Sagem as well as the LG are used in the Payez Mobile NFC Trial in Strassbourg and Caen. The Sagem was used in a Trial with the metro in Paris too. The Touch & Travel Trial from Deutsche Bahn uses the Motorola. The Nexus 4 (slate phone) is Googles fourth generation Nexus phone and was released Q4/2012. It was manufactured by LG and has an Broadcom BCM20793 NFC chip embedded with an STMicroelectronics secure element in one package. It does not have an SD-card slot like all Nexus phones since the Nexus S (second generation). It shipps with Android 4.2, which is upgradeable to 4.2.2. The Galaxy Note II (phablet hybrid) was released Q3/2012 by Samsung. It has a 5.5" HD Display and is a hybrid of a phone and a tablet. It comes with the PN65 NXP NFC chip, which embedds the NXP PN544 controller and an additional secure element (e.g. Google Wallet) in one package. The Phone shipped with Android 4.1.1, which is upgradeable to version 4.1.2. The Windows Phone 8X (slate phone) was released Q3/2012 by HTC. It has an PN544 NXP NFC chip inside and shipps with Windows Phone 8 OS. The One X (slate phone) was first released Q2/2012 and launched in different versions by HTC. It has an FN544 NXP NFC chip inside and shipps with Android 4.0.4, which is upgradeable to 4.1.1. The Galaxy S III (slate phone) is the third generation of Samsungs very popular Galaxy S series and it was released Q2/2012. It comes with the PN65 NXP NFC chip, which embedds the NXP PN544 controller and an additional secure element (e.g. Google Wallet) in one package. The Phone shipped with Android 4.0.4, which is upgradeable to version 4.1. The Sony Xperia S (slate phone) was released Q2/2012 by Sony (and is also known as Sony Ericsson Xperia NX in Japan). It comes with the PN65 NXP NFC chip, which embedds the NXP PN544 controller and an additional secure element (e.g. Google Wallet) in one package. The Phone shipped with Android 2.3, which is upgradeable to 4.1. The Optimus 4X HD (slate phone) was released Q2/2012 by LG. It has an PN544 NXP NFC chip inside and shipps with Android 4.0, which is upgradeable to 4.0.3. The Bold 9900/9930 (brick with touchscreen) was released Q3/2011 by BlackBerry. It has an Inside Secure NFC chip embedded with an Infineon secure element in one package. The phone shipps with BlackBerry OS 7. The Galaxy Nexus is Googles third generation Nexus phone. It was manufactured by Samsung and released Q4/2011 by Google. It comes with the PN65 NXP NFC chip, which embedds the NXP PN544 controller and an additional secure element (e.g. Google Wallet) in one package. It does not have an SD-card slot like all Nexus phones since the Nexus S (second generation). It shipps with Android 4.0, which is upgradeable to 4.2.2. The Galaxy S II (slate phone) is the second generation of Samsungs very popular Galaxy S series . It was released Q2/2011 and was optionally equipped with an PN544 NXP NFC chip. It shipped with Android 2.3, which is upgradeable to version 4.1. The Nexus S (slate phone) was manufactured by Samsung and released Q4/2010 by Google. It was one of the first phones to come with the PN65 NXP NFC chip, which embedds the PN544 NXP NFC controller with an additional secure element (e.g. Google Wallet) in one package. It is also the first Nexus without an SD-card slot. Initially it was shipped with Android 2.3, which is upgradeable to version 4.1.2. The Sagem phone (brick) come with an Inside-Technology NFC chip. This chip has a special feature: even without battery NFC transactions can be performed. Thus this feature is called battery off mode. A Gemalto SIM-Card is connected thru SWP to the NFC controller and acts as the secure element in this case. (Phones + SE-SDK available to NFC-Research). Device is not intended for sale/mass market. 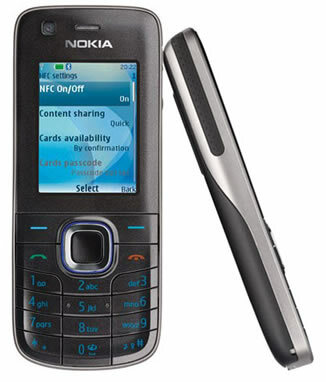 The Samsung SGH-X700n (brick) is the NFC edition of the SGH-X700 phone. The phone comes with a NXP NFC platform inside, allowing all three operating modes (P2P, R/W, Tag). The SDK is propriatary. This phone is used for the trial in Hagenberg. (Phones + J2ME and SE-SDK available to NFC-Research). Device is not intended for sale/mass market. Motorola's NFC Edition of the L7 (brick) also comes with Inside Contactless technology inside. The handset manufacturer is also working on a new model to be used at the touch&travel pilot in Germany. The Trial uses a SIM Card (Type A!) from G&D. The Device is not intened for sale/mass market. The touch points of the touch and travel projects are features by NXP. The Samsung SGH-D500E (Slider) was the first NFC-phone presented (CeBit 2005). This phone was used during the NFC in Caen in 2005/2006. The NFC controller als well as the secure element in this phone are manufactured by NXP.